Photo: Seated Buddhas at a Wat in Ayutthaya. In 1448, King Borommatrailokanat ordered that a temple be added as a centrepiece to his glittering palace complex. 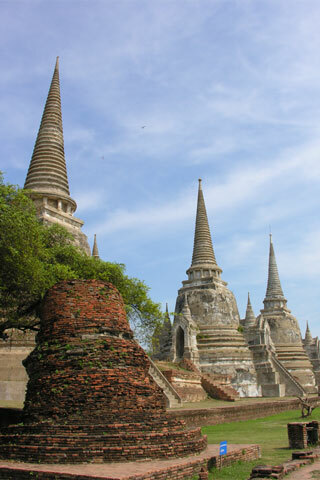 Browse places to stay in Ayutthaya on Booking.com. Book Now - Pay Only When You Stay. A wihaan was built in 1499 and, a year later, a 16-metre-tall Buddha image known as Phra Buddha Chai Sri Sanphet was cast and covered in gold. For over two and a half centuries, it sat as a spiritual and geographical anchor of the entire kingdom. Used mainly for ceremonies that served to authenticate the king’s spiritual and moral authority, Wat Phra Si Sanphet was the official royal temple. No monks lived here and only people within the royal circle were allowed to enter. Modern Thai royalty has a similar setup at Wat Phra Kaew, located within the modern Grand Palace complex in Bangkok, a difference being that it’s usually open to the public. Destroying Wat Phra Si Sanphet and the Royal Palace was a priority of the invading Burmese, who sought to completely obliterate Ayutthaya rather than simply add it as a tributary kingdom. They melted down 160 kilos of gold from the Phra Buddha Chai Sri Sanphet image and set fire to everything else. In the late 18th century, the remaining bronze core of the image was transferred to Wat Pho in Bangkok. Three large bell-shaped chedis containing the ashes of King Borommatrailokanat and his sons are now the highlights of Wat Phra Si Sanphet. The chedi trio is very photogenic, especially in the rich late-afternoon light. The silhouette of the slender chedis fronting the setting sun has become a symbol of Ayutthaya. You’ll also find the remains of minor chedis and walls made of brick, with the whole spread punctuated by frangipani trees. What’s left of the Ancient Palace is spread over a vast area beyond Wat Phra Si Sanphet as a loosely defined conglomeration of badly damaged redbrick ruins. One of the largest structures, Chantharakasem or the “Front Palace”, is hardly discernible as a cohesive structure with its headless Buddha images, cracked pillars and brick bases that mingle with green grass. Keep wandering and you’ll come across the ruins of several other buildings within the Ancient Palace complex; it will take some serious patience to get a feel for how it all looked when the piles of brick served as frames for elaborate buildings with gold-covered roofs. To appreciate the scale of the original palace complex without spending a week retracing it on the ground, see the model displayed upstairs in the tourist info office on Si Sanphet Road. Wihaan Phra Mongkhon Bophit is next door to Wat Phra Si Sanphet and usually hit as part of the same excursion. Last updated on 5th March, 2016. Wat Phra Sri Sanphet is located at the heart of the Historical Park, where Naresuan and Si Sanphet roads converge. The front gates are to the right if facing Wihaan Phra Mongkhon Bophit. Browse our independent reviews of places to stay in and around Ayutthaya. Read up on where to eat on Ayutthaya. Check out our listings of things to do in and around Ayutthaya. Read up on how to get to Ayutthaya, or book your transport online with 12Go Asia. Planning on riding a scooter in Ayutthaya? Please read this. See below for more sights and activities in Ayutthaya that are listed on Travelfish.org. Where are you planning on heading to after Ayutthaya? Here are some spots commonly visited from here, or click here to see a full destination list for Thailand.